We’ve all experienced toxic people in our life. Perhaps it was a romantic relationship, a family member, co-worker, or a person you thought was a close friend. Over time, you began to realize that they were difficult, draining, unsupportive, and self-centered. Although some toxic people are completely unaware of their negative influence on those around them, others gain satisfaction from knowing that they can bully and manipulate those closest to them. The goal is to be able to identify the toxic people in your life and distance yourself from them as soon as possible. 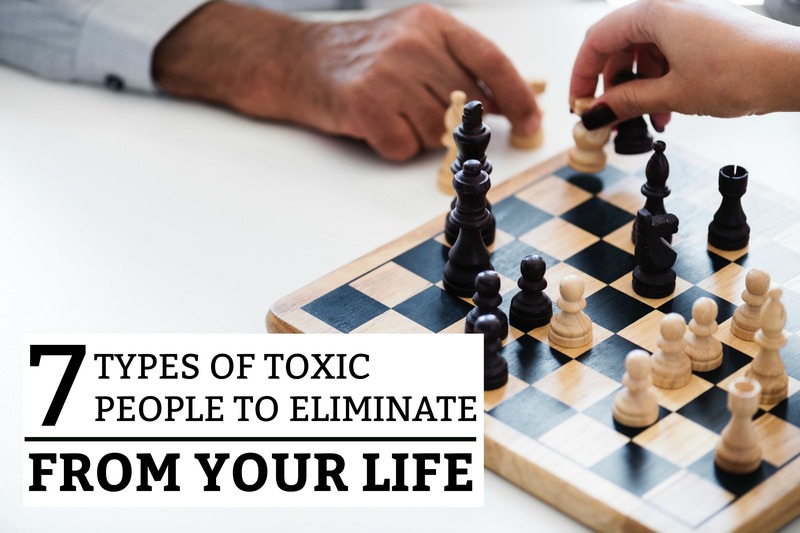 Below are 7 types of toxic people you need to eliminate from your life ASAP! A gossip loves nothing more than to talk or hear about other people’s misfortune. It is only human to be curious about the lives of other people. However, the gossip loves to peer into the lives of others and make assumptions, talk about ‘what-ifs”, laugh about their problems, and discuss topics that are none of their business. This toxic quality has a draining effect on people who prefer to be genuinely nice and empathetic. Don’t waste your time on friends like this! Not only will you become associated with their negative character qualities, they will probably eventually gossip about YOU. This person can find something wrong with every single thing in life. They may pride themselves on just “being real”, but they are serious mood killers! They judge others, can’t take a compliment, are often sarcastic, constantly worry, and bring a cloud of negativity over every area of life. If you have a friend that only has bad things to say whenever you see them, you may want to create some distance with them – for your own sake. This article goes into greater detail about the signs of a negative person. …self-obsessed, unempathetic, manipulative, guilt-tripping, love-bombing, etc. The narcissist is absolutely amazing – and they make sure you never stop hearing about it! They can always one-up you. They talk about themselves 24/7. Your problems really don’t matter to them. If you start to distance yourself from them, they go crazy! No-one does what they don’t want without consequences! Perhaps they’ll give you the silent treatment, love-bomb you with compliments and gifts, or destroy you by spreading lies and gossip. Remember, narcissism is a personality disorder and it is incredibly toxic and destructive. Your best option: go no-contact. Don’t let them manipulate their way back into your life! If you can’t believe a word that comes out of someone’s mouth, you may not want to be friends with them! It is absolutely exhausting to be around someone who constantly twists stories, exaggerates facts, and outright lies. This may come in the form of exaggerating a story to gain more attention. Or twisting the truth to gain more sympathy. Dishonesty is a slippery slope that often leads to broken trust and resentment. If their stories never align, facts seem over-the-top, or you always feel the need to fact-check their stories, you probably don’t want to hold that person in confidence. Eventually, you will probably find yourself at the receiving end of the lies and exaggeration. No matter your age, you will always come across totally fake people! …the person that insists on being “best friends” right away, asking personal questions, and insisting on being a part of your life. You’re a nice person, so you give them the benefit of the doubt! Maybe they really are incredibly kind and loving?! Then, out of the blue, they stab you in the back! …just like back in high school. These people are shallow and manipulative, but they usually have incredibly low self-esteem. When you encounter incredibly nice people who come into your life very quickly, make sure to focus on taking things slowly. You want to make sure that their intentions are sincere and their influence is something you want in your life. Putting a person in a place of trust and influence, only to have them stab you in the back is an incredibly hurtful thing to go through. If you start to see signs that this new friend is toxic, kick them to the curb! You don’t need that in your life. Do you have a friend that seems nice, but they are always asking for favors? Although some people are completely unaware that they seem like ‘moochers’, others see their friends as people that can do free stuff for them. Have you ever had someone ask you a ridiculously bold question – without flinching, like it was normal to them? They’re probably a professional moocher! Remember, every human relationship is a two-ways street. If someone is always ‘withdrawing’ from the relationship and rarely ‘depositing’, you need to have a serious conversation with them. If nothing changes, it may be time to say “Goodbye”. Do you have someone in your life who seems to act weird and distant sometimes. Maybe they don’t like sharing you with other people. Perhaps they are jealous about a recent accomplishment in your life? Or maybe your life is going really well, while theirs seems to be going nowhere. Jealousy can become unbelievably toxic, destructive, and even dangerous! If you start to see signs of envy in your friendship, you need to put up your guard and be very careful. Jealousy can take over a friendship like a disease – causing a person to do things and say things that are incredibly hurtful and unforgivable. Make sure the people that are closest to you have your best interest at heart. Life’s relationships are there to teach love, understanding, patience, and forgiveness. If you deeply care about someone who is showing toxic tendancies, have a conversation with them about the impacts of their actions. If they will not identify their destructive behavior, you will need to get them out of your life.